Say what you will about Sanchez’s game-to-game inconsistencies, his trouble with short throws (he completed 59.8 percent of his passes under 10 yards in 2010, about eight points below the league average) and his struggles with accuracy (he was 29th in the NFL with a 54.8 completion percentage last year), but all Sanchez has done since coming into the league two seasons ago is win, which is what all signal-callers are ultimately measured on. He has a 19-12 record in the regular season. Sanchez has taken the Jets to back-to-back AFC Championship games, going 4-2 in the playoffs, with all four of those wins coming on the road, tying the NFL-record for most road postseason victories ever. He does benefit from playing on a team with a great defense, but when you look at it, Sanchez is probably the biggest reason the Jets do so well in big games. In the postseason, he has thrown nine touchdowns compared to three interceptions and is a 60.5 percent passer for a playoff QB rating of 94.3. 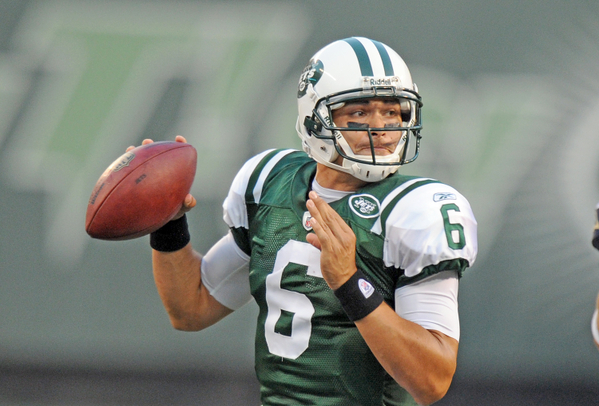 The Jets believe they will see more of that big-time quarterback consistently in Year Three of the Sanchez/Rex Ryan Era. Romo gets a bad rap because he has only one playoff win (compared to three losses) as the Cowboys starting quarterback. However, he was one botched-snap as a field goal holder (a position he should not have been playing anyway as Dallas’ starting quarterback in the Cowboys’ 21-20 postseason loss to the Seahawks in 2006) from at least one more. There are few quarterbacks that do a better job of utilizing all of their weapons as Romo. 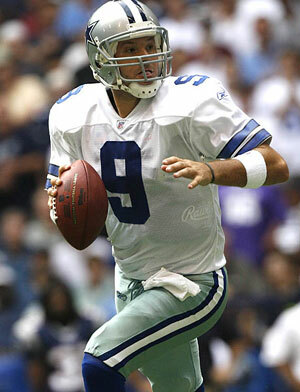 Since becoming Dallas’ starting quarterback midway through the 2006 season, Romo has taken the Cowboys to the playoffs in three different seasons. Dallas had been to the playoffs just four times previously since 1996. Romo is 28-17 as a starting quarterback, has passed for over 4,000 in his only two full seasons, has thrown at least 25 touchdowns in three different years and has an overall QB rating of 95.5, sixth-best in the NFL since becoming a full-time starter. As each season has gone on, the former first-round pick from the University of Delaware has looked more and more comfortable in the pocket. His numbers reflect that. Flacco has thrown for more yards and more touchdowns while improving his quarterback rating in each professional season from the year before. He has proved to be a tough quarterback, never missing a game in any of his three seasons, going 32-16 in the regular season. The Ravens are the only team in the NFL to make the playoffs in each of the past three seasons and Flacco is a large part of why they’ve been so successful recently. However, the next step for Flacco towards becoming an elite signal-caller is to play his best against the best teams in the NFL in the postseason. He has completed just 53.3 percent of his passes in the postseason with four touchdowns, seven interceptions and a 61.6 passer rating. The vaunted Ravens defense has bailed him out, though, as Flacco is also tied for the most postseason road wins ever, compiling a 4-3 overall playoff record in games that have all taken place away from Baltimore. 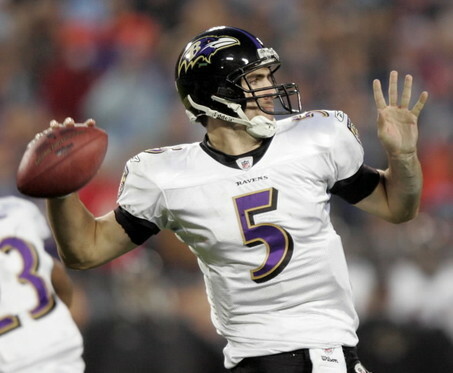 In order to get home playoff games, Flacco must prove he can beat the Pittsburgh Steelers, the Ravens’ arch-enemy. Flacco is just 2-6 against Pittsburgh and has thrown for seven touchdowns compared to eight interceptions against their pressure defense. Despite playing in only 12 games, Vick was statistically the NFC’s best quarterback last season. He compiled 3,018 yards in the air, another 676 on the ground and scored a combined 30 touchdowns compared to just six interceptions. At his best, Vick can make plays with both his feet and his arm. He is the ultimate dual-threat quarterback in the NFL. However, he must prove he can stay healthy, and to do that, he may need to be less aggressive in taking off in the pocket to avoid hits. He also must prove to be more accurate when he is forced to stay in the pocket. In his first seven games of 2010, Vick threw for 1,608 yards, 11 touchdowns and zero interceptions for a passer rating of 108.7. Once defenses began to make adjustments to keep Vick from scrambling away, he did not fare as well. Over his final five games, Vick passed for 1,410 yards, 10 touchdowns and six picks for a rating of 91.2. 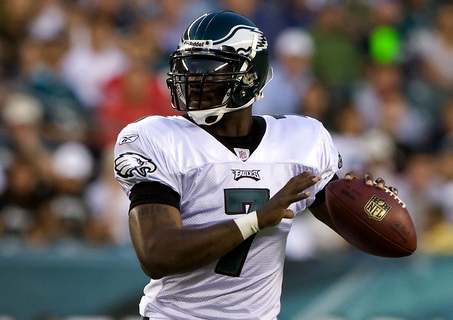 Vick must prove that last season’s incredible and accurate start was not an anomaly. There is no quarterback who has been better statistically over the past three seasons. Only Drew Brees and Peyton Manning have thrown for more yards and touchdowns than Rivers’ 12,973 and 92, respectively. No quarterback has averaged more yards per attempt over the last three years as Rivers (8.6) and nobody has a better passer rating since 2008 than Rivers’ 103.8 mark. Since taking over for the departed Brees as San Diego’s full-time starter before the 2006 season, Rivers is 55-25 and has never missed a start in those five seasons. The only thing holding him back from the elite level of quarterbacks is his postseason performance. In seven playoff games, Rivers is 3-4 and has passed for 1,820 yards, eight touchdowns and nine picks while completing 58.5 percent of his passes for a 79.2 rating. He is a Super Bowl ring shy of being mentioned in the conversation as the NFL’s top signal-caller. Judging by statistics, Roethlisberger belongs nowhere near this list. He has thrown more than 3,500 yards in a season just twice in his seven-year career, reaching 3,513 yards in 2006 and 4,328 yards in 2009. 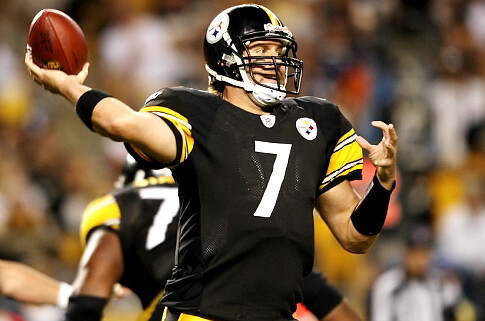 Roethlisberger has also thrown for more than 20 touchdowns in only two seasons (32 in 2007 and 26 in 2009) and led the league in interceptions during the 2006 season with 23. That being said, Roethlisberger is the ultimate winner at quarterback. His play may not be pretty, but he gets the job done. He is 69-29 in the regular season as a starter and has all but assured his Hall of Fame legacy by taking the Steelers to three Super Bowls, winning two of them. In 13 career postseason games, Roethlisberger is 10-3 and has passed for 2,861 yards with a 61.2 completion percentage, 19 touchdowns and 16 interceptions for a 84.5 rating. He may never put up great numbers, but Roethlisberger is certainly a winner at the quarterback position. Brees completed just 59.4 percent of his passes and tossed 31 interceptions compared to 29 touchdowns in his first three seasons with the Chargers from 2001 through 2003. Before the 2004 offseason, the Chargers drafted Eli Manning and then traded him to the Giants for Philip Rivers (see above). Motivated that San Diego did not think of him as its future at the quarterback position, Brees’ career took off. 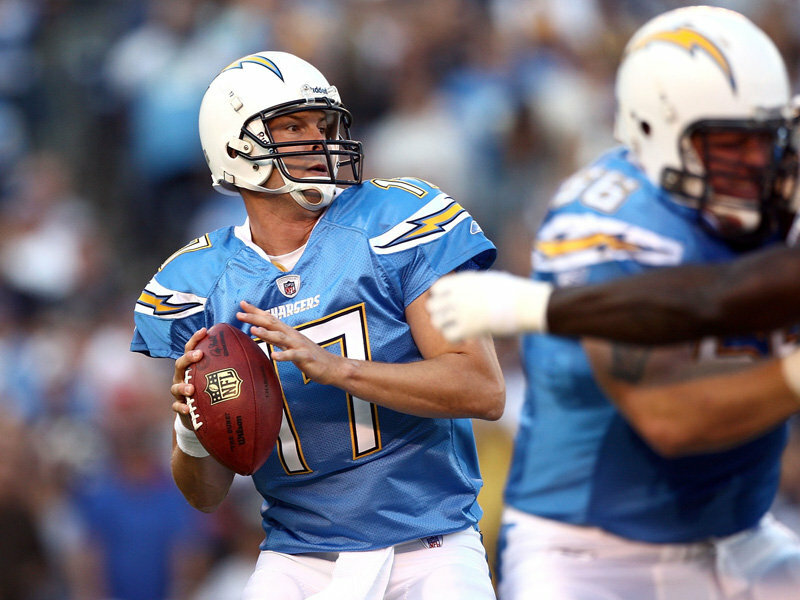 He threw 27 touchdowns compared to seven picks in 2004 and was so good that the Chargers re-signed him following the season. In 2005, Brees suffered a career-threatening shoulder injury and San Diego elected to let him walk as a free agent. The Miami Dolphins flirted with signing Brees briefly before deciding he was too much of an injury risk, instead signing Daunte Culpepper. That allowed the New Orleans Saints, coming off a 3-13 season, to sign Brees. The move ended up being a perfect fit for both sides. Brees immediately led the Saints to a 10-6 season, their first winning season since 2002, and revitalized a region that had been devastated by Hurricane Katrina with hope and numerous hours of community service. 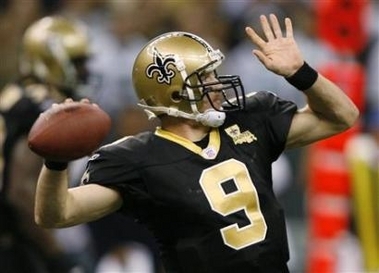 In 2009, Brees led the NFL with 34 touchdowns and a 70.6 percent completion percentage en route to New Orleans’ first-ever Super Bowl title. In his time in New Orleans, Brees has become the leader of not only the locker room, but of the community. He has thrown for no less than 4,388 yards or 26 touchdowns in a season. In his five seasons, Brees has passed for 22,918 yards, tossed 155 touchdowns compared to 79 picks while completing 67 percent of his passes for 95.9 rating to lead the Saints to a 49-30 regular-season record. Those numbers do not even come close to quantifying the impact Brees has had on the city of New Orleans. 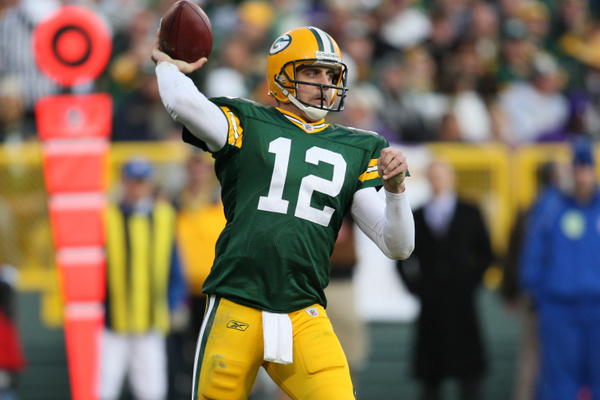 Rodgers played in just seven games over his first three professional seasons in Green Bay. Backing up Brett Favre, Rodgers threw for 329 yards, one touchdown and an interception for a 73.3. We all know the story of how Packers general manager Ted Thompson and head coach Mike McCarthy chose Rodgers over Favre as Green Bay’s starting quarterback before the 2008 season. Since then, Rodgers has not thrown for fewer than 28 touchdowns in a season, passed for over 4,000 yards twice, completed 64.6 percent of his passes and led the Packers to their first Super Bowl championship since 1996. In fact, Rodgers seems to play his best when the pressure is at its peak. In five career postseason games, he is 4-1 while completing 67.8 percent of his passes, throwing for 1,517 yards, 13 touchdowns and three interceptions for a 112.6 rating. As the leader of the defending champion Packers, who have the second-youngest roster in the NFL, Rodgers has a chance to win multiple championships in the coming years to cement his resume as one of the all-time greats of this era. There is probably no player in the NFL who is more valuable to his team than Peyton Manning. He is not only a terrific quarterback, but is essentially another coach on the field. No other quarterback calls every single play an offense runs. It’s well-documented how complex the signals he uses to make audibles. And despite a defense that has ranked in the top ten in yards allowed just twice in his 13 thirteen seasons, Manning has led the Colts to tie an NFL record with nine consecutive playoff berths. 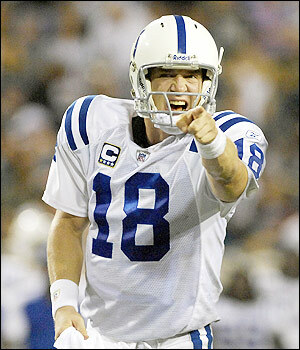 Before drafting Manning in 1998, the Colts had not posted double-digits wins in a season since 1977. With Manning under center, Indianaplis has reached double-digit wins in nine straight years and 11 out of the past 12 seasons. Manning’s numbers are also staggering. He has thrown for under 4,000 yards just twice in his career. 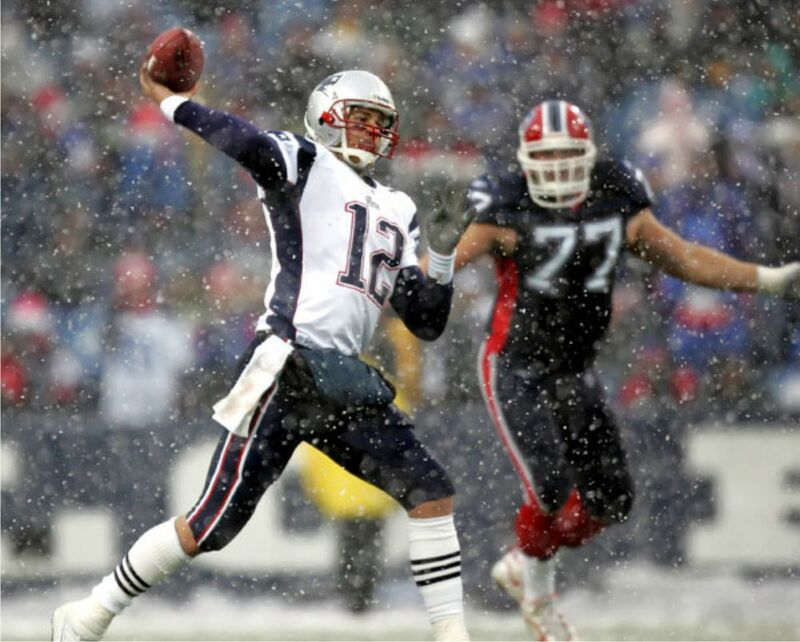 He has never thrown fewer than 26 touchdowns in a season and is second behind Tom Brady for most touchdowns thrown in a single season, when he tossed 49 in 2004. Manning has led the NFL in touchdowns and passer rating three times, yards twice and completion percentage and yards per attempt once each. Despite a Super Bowl championship, Manning has just a 9-10 record in the postseason, which is why he is not number one on this list. He will miss the first game of his career because of multiple neck surgeries this Sunday. If he is able to win one more Super Bowl, there may not be a better quarterback in the history of the NFL. Manning is a tremendous leader, a rare quarterback who not only has all the physical tools needed at the position, but the mental ones as well. No signal-caller can decipher whatever a defense is throwing at him quicker than Peyton Manning. Since Troy Aikman led the Dallas Cowboys to the 1995 Super Bowl, no quarterback has won as many Super Bowl rings as Tom Brady. Not only is he a winner, but Brady has also put up insane numbers in the New England offense. His 50-touchdown 2007 season, in which the Patriots were nearly perfect, falling to the Giants in the Super Bowl for their only loss of the year, is the most touchdowns thrown by any player in a single year in NFL history. Like Manning, Brady has led the NFL in different categories a number of times. Brady has been on top in touchdowns three times, passing yards and rating twice and completion percentage and yards per attempt once each. Perhaps no season represents how smart Brady is with the football than this past year in which he threw an NFL-leading 36 touchdowns compared to just four interceptions. It is nearly impossible to fluster him under pressure and because of that, he rarely makes the mistake of giving the ball away to opposing defenses. Brady has also built a postseason resume rivaled by few quarterbacks in history. He won his first 10 playoff games over four different postseasons, winning three Super Bowl rings in the process. He has gone just 4-5 in the playoffs since, though, but is still one of just four quarterbacks ever to win three Super Bowls and one of six to lead their team to at least four appearances in total. With his playoff magic, tremendous statistical seasons and great leadership, Brady will go down as one of the greatest quarterbacks of all-time, if not the best. He is the last quarterback defenses want to see under center in the postseason or with the game on the line. His postseason success is the only thing that vaults Brady over Manning in this almost near-even matchup over who is the best quarterback in the NFL.